My most recent clean eating journey, which you can read my tips about HERE, has lead to my love of green smoothies. I love knowing that I’m sneaking in extra veggies that are rich in vitamins and anti-oxidants. 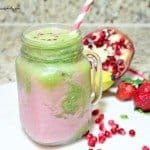 Plus, I can sneak them in on my girls, which is very simple to do with this fun Pomegranate Green Smoothie. When I first started drinking green smoothies, I always used spinach in them. During my clean eating journey I learned that I preferred kale over any other leafy green vegetable, which is great since it is one of the best vegetables available. 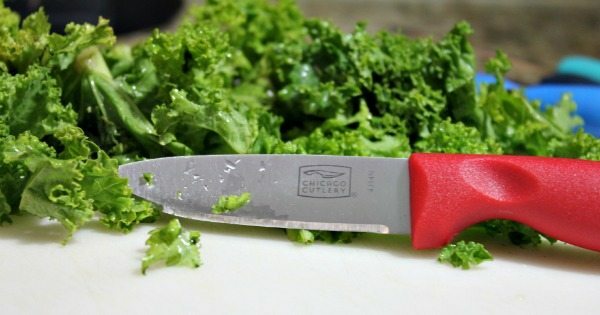 My clean eating journey was full of cutting up fresh vegetables and fruit and I quickly learned that I needed I needed a new knife set. I was thrilled when I received my Holiday Box from Acorn and inside I found Chicago Cutlery Knife Set. The set is perfect for everyday chopping and mincing and can be easily found at Walmart. Inside my Holiday Box from Acorn I also found a Nutri Ninja with Auto IQ. The Nutri Ninja came with two size cups, which made it easier than ever to blend up my ingredients for this Pomegranate Green Smoothie. I didn’t need to worry about washing one out and having the remnants of the first blend in with the second. It made my life so much easier and if you’ve ever used a Nutri Ninja you know how fabulous their products are. I love that I can push the blend button and it goes to work at the speed and consistency that is needed to fully blend my smoothie. Plus, it’s easily found at your local Walmart as well. 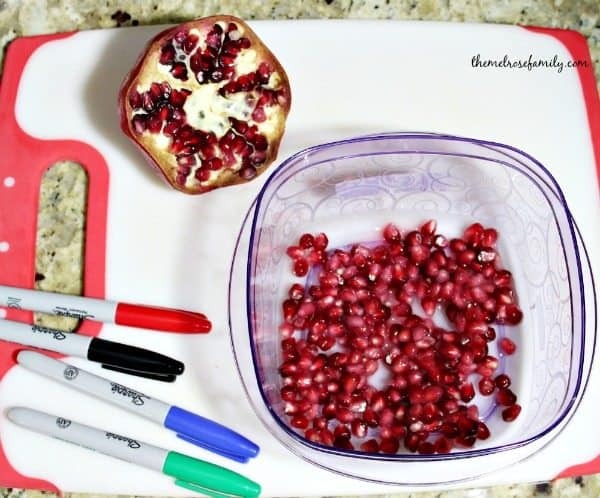 I enjoy using pomegranates in my recipes, but I often feel like I waste them and it’s a bit of work to get to the pomegranate arils. Luckily, my Holiday Box from Acorn also came with a Rubbermaid 5-cup Premier Food Storage container that was the perfect size for storing my leftover pomegranate arils so that I can make my Christmas Sangria later this week. Plus, the Sharpie Extreme Marker Set helps me keep everything labeled with date that the food was stored. Simplicity at it’s finest! 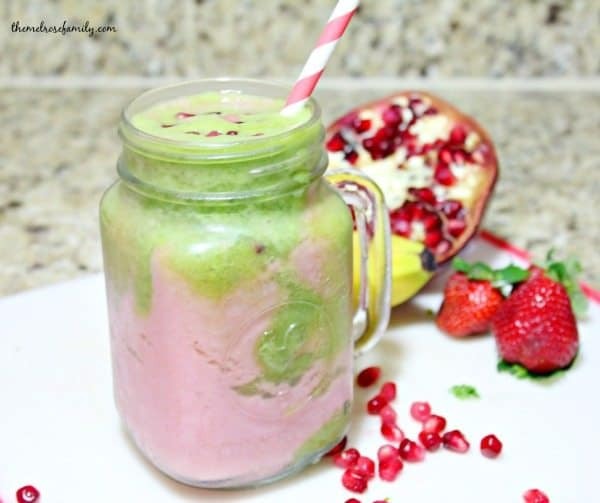 Not only is this smoothie healthy, but it also tastes amazing. Plus, my girls love the fact that the colors start to meld into each other. 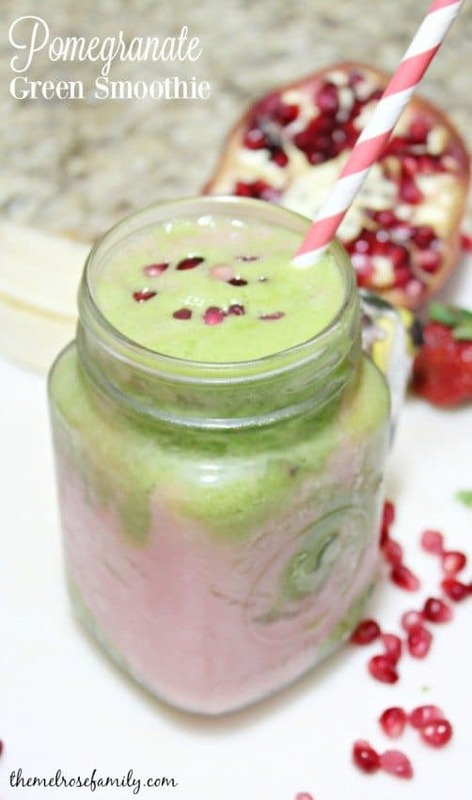 Our Pomegranate Smoothie is definitely one that everyone will love. In the smaller Ninja blender cup combine 1 banana, 1/2 cup of frozen organic strawberries and 1/2 cup of coconut water and pulse using the smart IQ blender button. 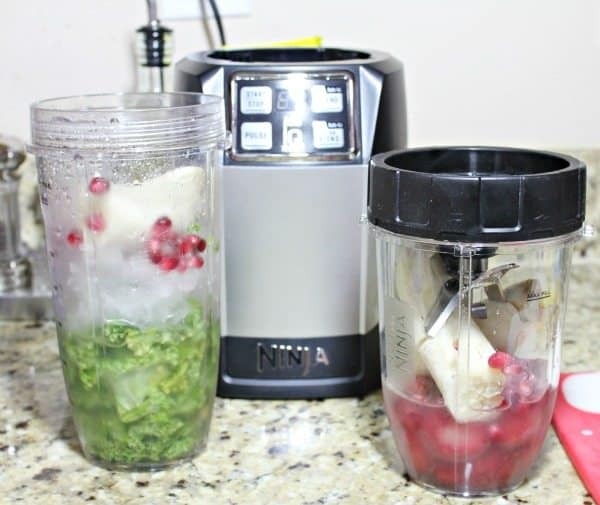 In the larger Ninja blender cup combine the 1/2 banana, 1 cup chopped kale, 1/2 cup crushed ice and 1/2 cup of pomegranate arils and pulse using the smart IQ blender button. Pour the strawberry smoothie portion and top with the green smoothie portion. One last tip. I learned so much during my clean eating journey but I was most struck by my new found love of tea. I was always a coffee drinker and tea was not something I was even slightly interested in. 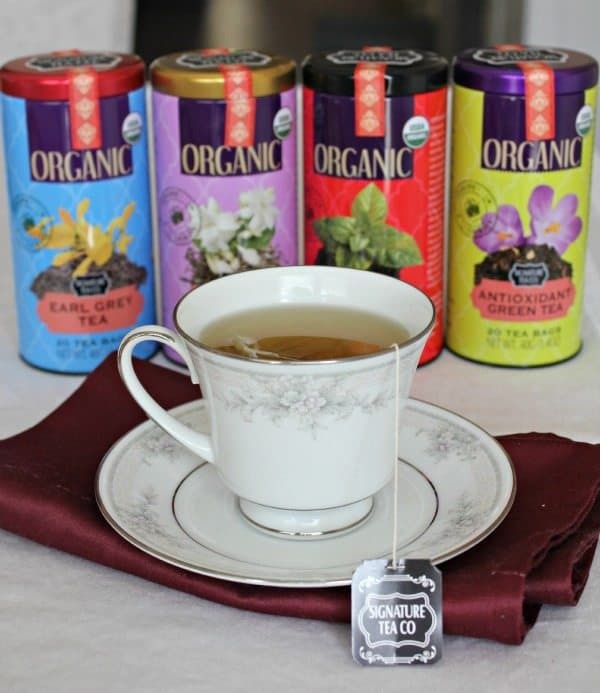 My journey showed me the value and a good organic tea, which is why I was thrilled to also find Signature Tea Company in my Holiday Box from Acorn. Not only is it flavorful and organic, but it can also be found at Walmart.